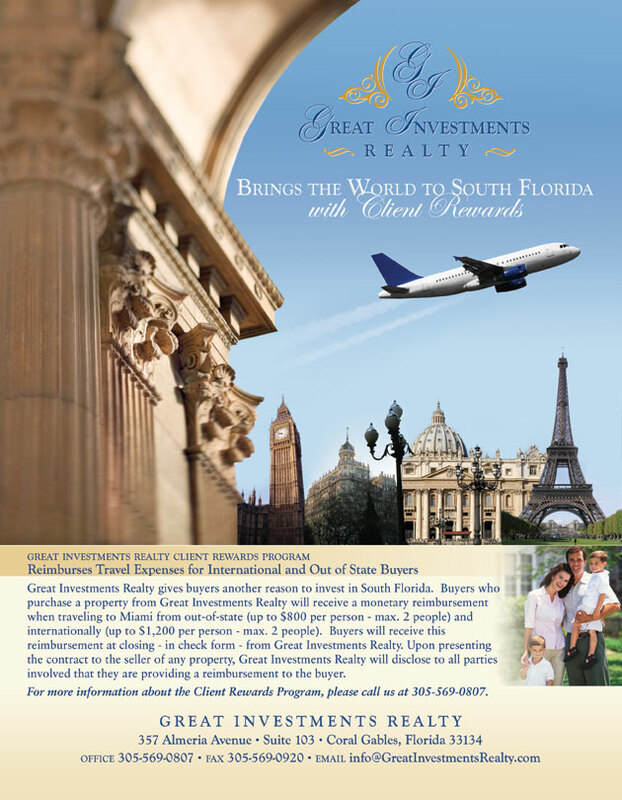 Great Investments Realty gives buyers another reason to invest in South Florida. Buyers who purchase a property from Great Investments Realty will receive a monetary reimbursement when traveling to Miami from out-of-state (up to $800 per person – max. 2 people) and internationally (up to $1,200 per person – max. 2 people). Buyers will receive this reimbursement at closing – in check form – from Great Investments Realty. Upon presenting the contract to the seller of any property, Great Investments Realty will disclose to all parties involved that they are providing a reimbursement to the buyer. For more information about the Client Rewards Program, download the flyer, contact us online or call us at 305-569-0807.